FULL ALUMINUM TUBE&FIN 32"X 12"X3 FMIC FRONT MOUNT TURBO RACING INTERCOOLER KIT. Universal Lightweight Aluminum Tube and Fin Front-Mount Intercooler : When the charged air enters the end tank, it travels through the tubes of an Intercooler, in which the heat is transferred via fins, where cooler ambient air passes over the tubes. This mechanism further removes heat from air before exiting the opposite end tank and routing to the engine. 1 X Intercooler as Shown Above ONLY. Universal Lightweight Aluminum Tube and Fin Front-Mount Intercooler. High Performance Tube and Fin Turbo Racing Design. Made of High Quality T-6061 Aluminum Durable Material. Helps Reducing Engine Inlet Temperature. Allow More Horsepower at the Same Boost Level and Even More Power at the Higher Boost Level. 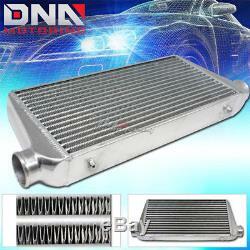 Intercooler Overall Size: 31.00" (L) X 12.00" (H) X 3.25(W). Core Size: 24.00" (L) X 12.00" (H) X 3.25(W). Inlet/ Outlet: 3.00/ 3.00. Professional Installer is Highly Recommended (No Instruction Included). Universally Fits Any Vehicle and Turbo ProjectPlease measure the area where the intercooler is planned to mount on to see if the dimension of this item fits the allotted space Modification might be Required for Some Vehicles. WE HIGHLY RECOMMEND PROFESSIONAL INSTALLATION! Video will open in a new window. Package will be held until a valid physical address is provided. Sign up to our Newsletter. Get all the latest News, Updates and Special Offers about our store. The item "FULL ALUMINUM TUBE&FIN 32X 12X3 FMIC FRONT MOUNT TURBO RACING INTERCOOLER KIT" is in sale since Monday, April 11, 2011. This item is in the category "eBay Motors\Parts & Accessories\Car & Truck Parts\Turbos, Nitrous, Superchargers\Turbo Chargers & Parts". The seller is "dnamotoring" and is located in Rowland Heights, California.